Many of us know where our machines or collectables originated from, we may have a brochure with the dealers stamp on it or perhaps a decal or sticker proudly displaying the suppliers details and the address where the machine or tool came from. Leap back many decades and retailers, many trading as ironmongers originally, would display tools, mowers and gardening paraphenalia in their shop windows on any ordinary high street. This was the time before motor cars and so with high streets being a hive of activity every week day with constant passing trade it was a great place to display products for sale. Recently we came across adverts for Gibbs & Dandy LTD who retailed from the Luton area and early adverts indicate they were ironmongers originally. 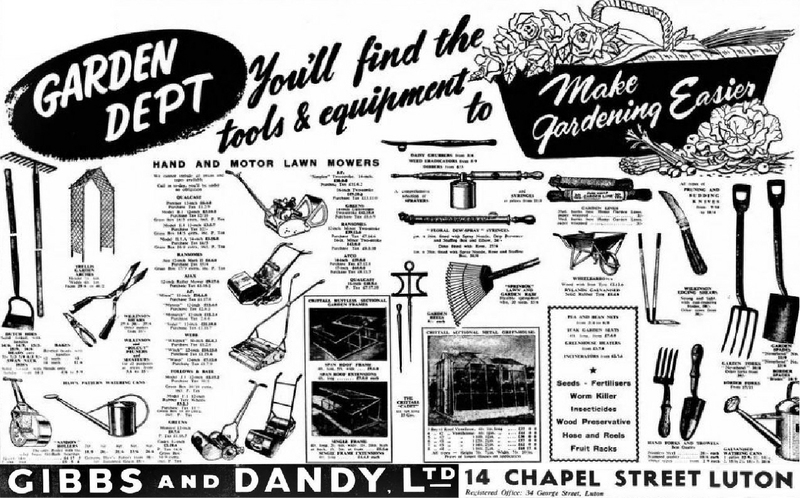 Into the 1950’s their adverts also show gardening equipment, lawn mowers and tools. But Gibbs & Dandy also did some great window displays and with the help of some newspaper research and Mr Google we find a little bit of history, although just as Woolworths and Pick ‘n’ mix expired so did Gibbs and Dandy shops and their displays which must have been enticing at the time. 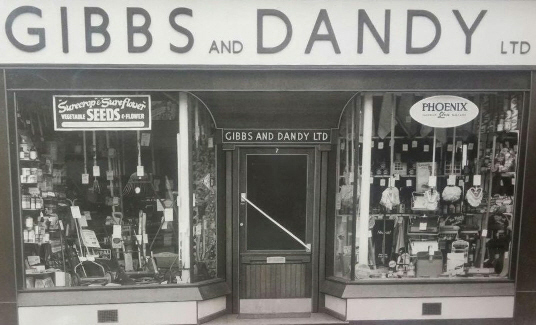 Gibbs & Dandy had a shop at 7, High Street South, Dunstable and certainly another at 14, Chapel Street, Luton. The Dunstable shop is shown below with a gardening display in the left window. A close up of that shop window (large image below) shows an array of items for sale. It appears to show shelves laden with potions and chemicals on the shelves to the left, the more one looks then the more interesting the image appears. The mower to the left is probably a Qualcast E1 (approx. £3/11/2 at the time) and the mower in the centre possibly a Qualcast Panther, the mower to the right a JP or perhaps a Greens – but it’s open to interpretation. Also visible are spades, rakes and hoes and to the back of the shop appears to be even more tools and items for the dedicated gardener. 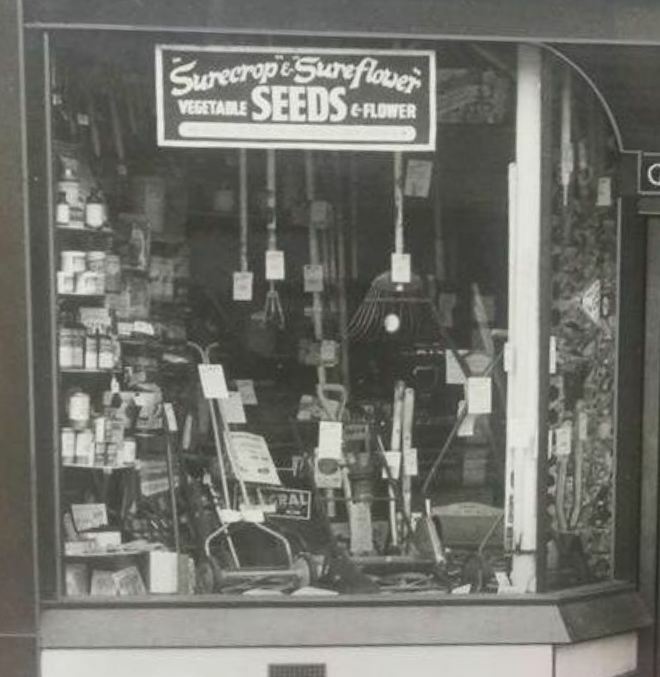 Don’t forget that the tools would have been bright with new steel and polished wooden handles and the mowers with bright blue or green paintwork, the ‘Surecrop’ seed advert hanging in the window was probably bright yellow and it would all have been a display to draw customers in. We are sure that many people would have stopped for a few minutes and looked at all the sparkling new tools and shiny machines, studying the price labels wondering if they could afford what they wished for. The Chapel Street Branch, above, also proudly displayed a sign indicating they had a garden showroom on the first floor. Although the image is not detailed but in the window can be seen spade and fork handles, we wonder what interesting items all pristine and in their boxes were waiting in that showroom, the sales people completely oblivious to the fact that one day the items may be collectable and be discussed on some new-fangled internet thing. Sadly though time moves on and the shops are no longer in operation, the Luton shop with decorative brickwork has been replaced by a modern glass building of little interest. The Dunstable shop is now a chemists, the passing customers no longer stopping to admire a great window display. But for a moment we can pause and with rose-tinted glasses firmly attached one can imagine how fascinating these establishments would be for us to visit now, rather than the plain shops of today. 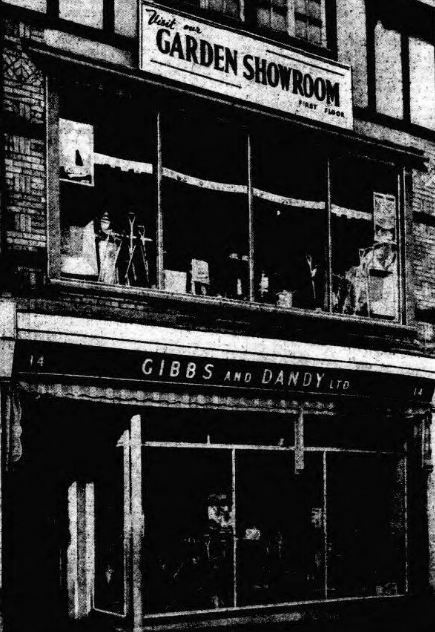 Image of the Gibbs & Dandy shop as it is now as a chemists on the left, long forgotten are the window displays of Gibbs & Dandy as in 1953 on the right. 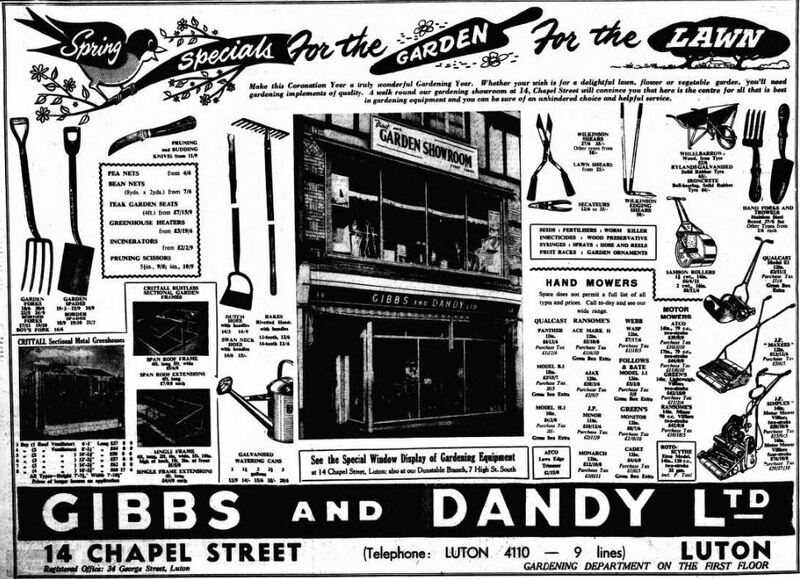 Below are two of the adverts from Gibbs & Dandy showing the garden items they sold. A variety of 1953 equipment including a JP Maxees mower (£13/12/6) Qualcast E1 (£3/11/2) and a JP Simplex 14″ (£59/10/0). Also a Samson roller. An advert for spring showing some of the items available.